Washington’s pass rush arrived on Wednesday. 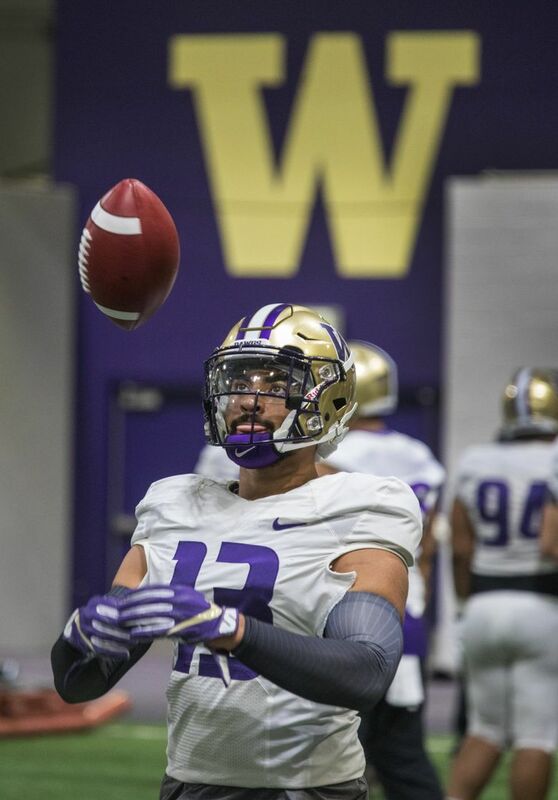 In all, four Huskies — defensive linemen Levi Onwuzurike and John Clark and outside linebackers Edefuan Ulofoshio and Joe Tryon — compiled a sack during scrimmage drills in UW’s fifth practice of the spring. Ulofoshio may have been most impressive, as the 6-foot, 233-pound redshirt freshman knifed up the gut to quickly tag quarterback Jacob Sirmon. Granted, none of said sacks included an actual tackle. But the Husky defense still undoubtedly applied the most consistent pressure it has mustered thus far in April. Obviously, that can be construed as a positive or a negative, depending on your perspective. But the unproven Husky pass rush — which mustered just 24 sacks in 14 games last season — will take a win where it can get it. 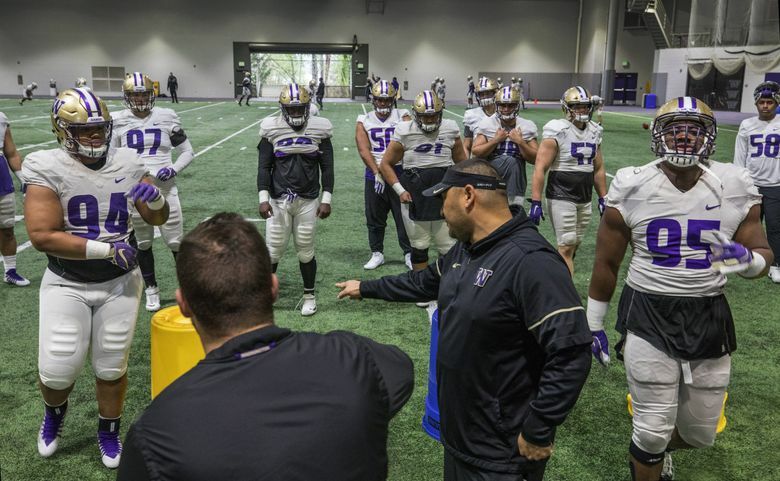 Here are a few more observations from Washington’s fifth practice of the spring. 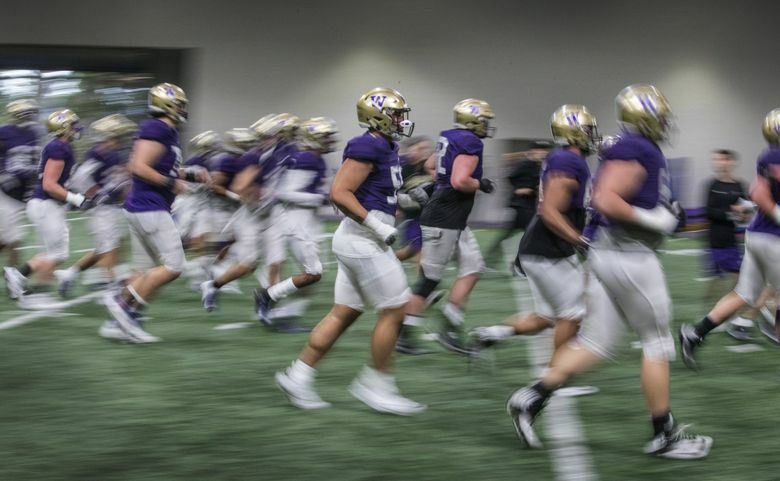 Sophomore quarterback Jake Haener has been inconsistent early in the spring, most notably throwing a pair of pick-sixes in Washington’s first four practices. Again taking the first reps with the starters, Haener had easily his most accurate practice, kicking off 11-on-11 drills with back-to-back strikes on touch passes down the seam to tight ends Hunter Bryant and Jacob Kizer. On the first pass, specifically, the 6-0, 196-pound sophomore dropped an arcing looper into Bryant’s hands behind the close coverage of starting nickelback Elijah Molden. Junior Jacob Eason — who started with the second team and later worked in with the 1s — showed room for improvement and his breathtaking potential in back-to-back passes. First, the 6-6 junior lofted a pass in Bryant’s direction out of bounds along the right sideline. Two plays later, he released a rocket to his left that found Bryant perfectly on an out-route. Eason later found Bryant again running down the seam past converted cornerback Isaiah Gilchrist. The UW quarterbacks did not produce either a touchdown or a turnover on Wednesday. Redshirt freshmen Colson Yankoff and Sirmon both struggled to consistently find their targets, though Sirmon also hit wide receivers Trey Lowe and Chico McClatcher on back-to-back long receptions across the middle. Early enrollee freshman quarterback Dylan Morris was not granted any reps during 11-on-11 scrimmage drills. For the second consecutive practice, senior Myles Bryant shifted from his typical nickelback position to free safety with the starters, lining up alongside junior Brandon McKinney. 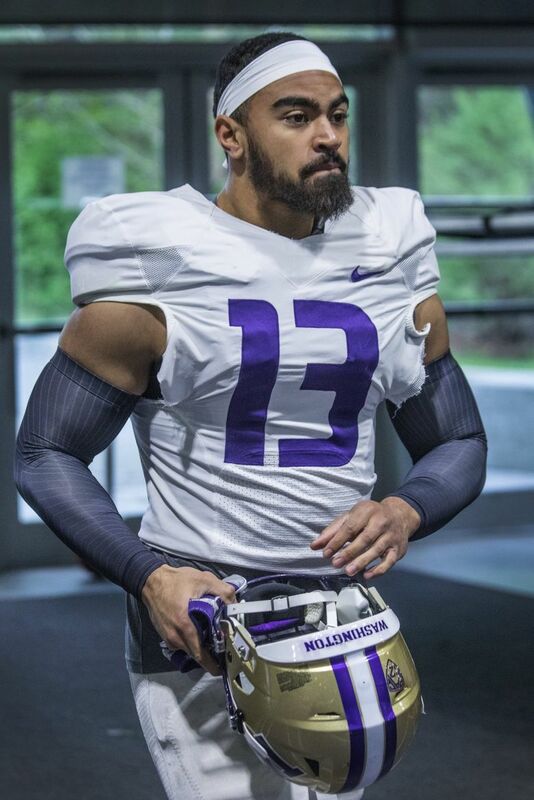 The other UW starters in the secondary were cornerbacks Keith Taylor and Kyler Gordon and nickelback Elijah Molden. 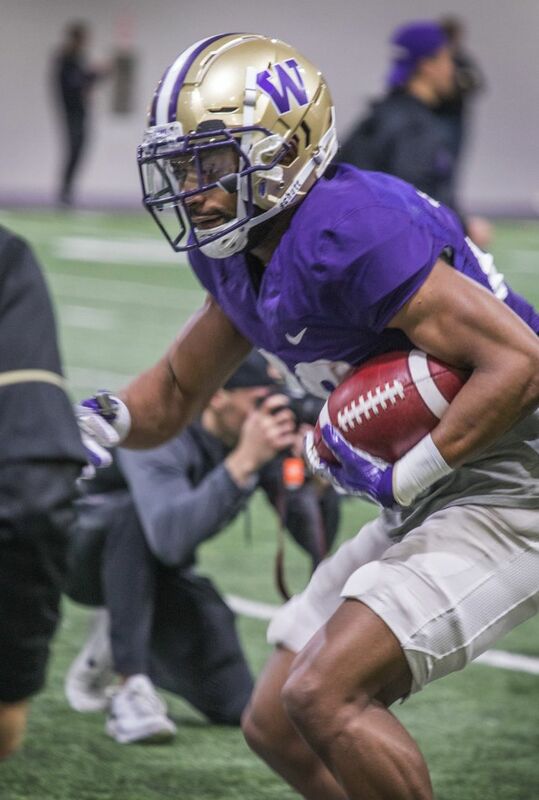 Washington defensive coordinator Jimmy Lake said after practice that they’re trying to train Bryant at multiple positions in case he’s needed in the regular season. It will be worth noting — and don’t worry, we’ll note it — where Bryant shows up in the rest of the spring. 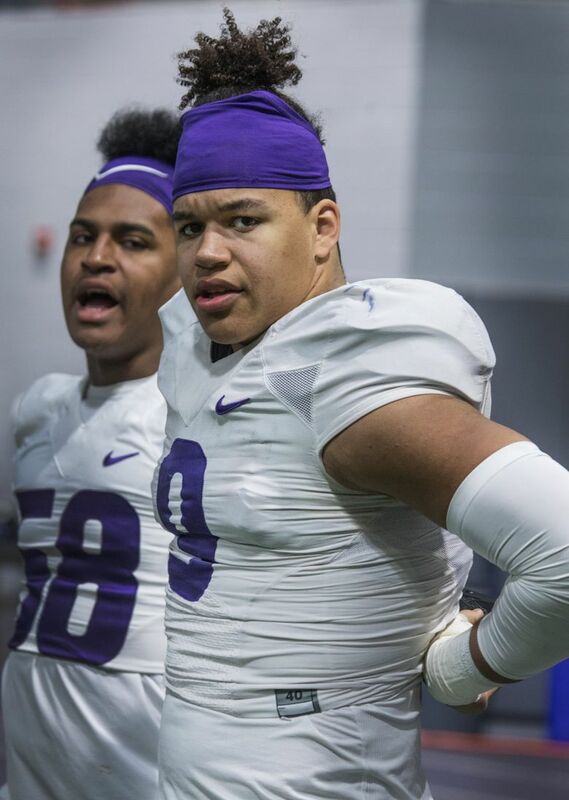 Sam Taimani — a 6-2, 322-pound redshirt freshman defensive tackle — worked almost exclusively with the starters on Wednesday, beside junior Levi Onwuzurike. 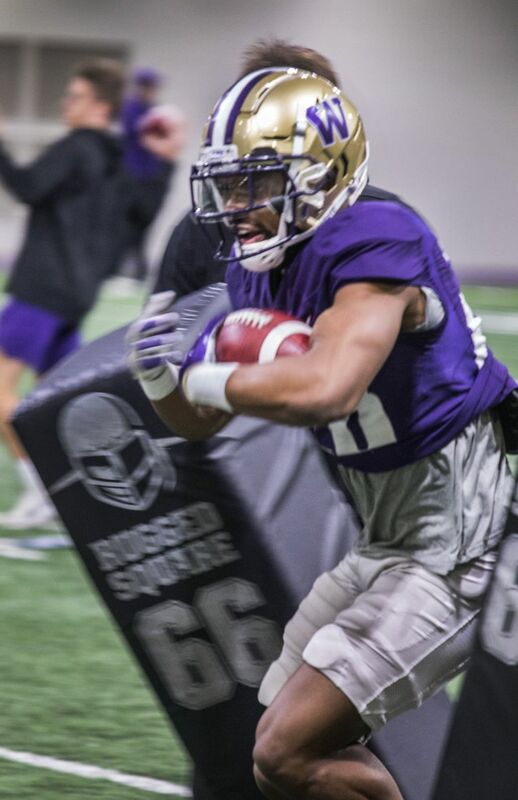 Taimani had received only sparing starting reps in UW’s first four practices, typically slotting behind fellow redshirt freshman Tuli Letuligasenoa. The Salt Lake City, Utah, native also made his presence felt. In a 7-on-7 running drill, Taimani burst up the middle and swallowed up running back Sean McGrew for a significant loss, causing the defense to erupt in applause. Letuligasenoa also made a similar stop a few plays later. Outside of Onwuzurike, there is much still to be decided on the defensive line this spring and fall. Taimani, Letuligasenoa, Clark, Josiah Bronson, Draco Bynum and Jason Scrempos are all competing for available reps. The following players did not participate on Wednesday with an injury: outside linebacker Myles Rice, wide receivers Aaron Fuller, Quinten Pounds and Ty Jones, linebacker D.J. Beavers and defensive lineman Jacob Bandes. Linebacker Miki Ah You, outside linebacker Zion Tupuola-Fetui, defensive back Julius Irvin and defensive lineman Sama Paama were all limited. There didn’t appear to be any new injuries on Wednesday. Redshirt freshman cornerback Dominic Hampton participated fully after being limited in Monday’s practice. Senior center Nick Harris — who apparently has been dealing with a minor injury — got back into a few scrimmage drills but was spelled by sophomore Cole Norgaard. With Rice and Tupuola-Fetui both injured, inside linebacker Ariel Ngata and defensive lineman Benning Potoa’e both spent time at their old outside linebacker spots. 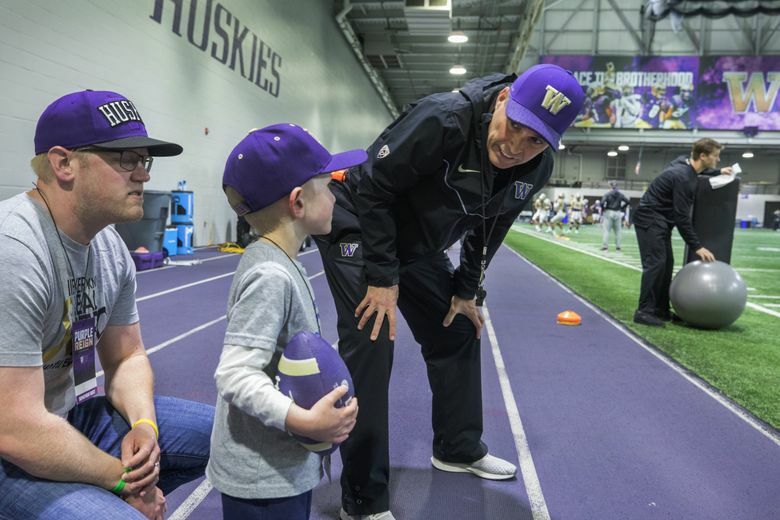 — Former UW quarterbacks Steve Pelluer and Jake Browning both attended Wednesday’s practice. 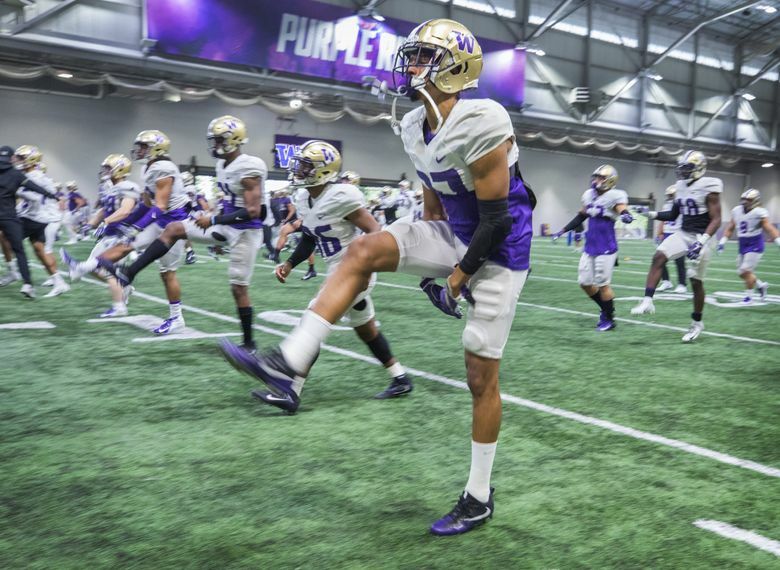 — Washington safety signee Asa Turner — who is presumably on his spring break — was also there on Wednesday and stood with the defensive backs throughout practice. — Ahmed’s burst was apparent throughout practice. The 5-11, 193-pound junior was explosive both up the gut and running around the edge. That should come as no surprise, but it’s exciting to see. — This was perhaps Austin Osborne’s most active practice in terms of overall catches. The 6-2, 198-pound redshirt freshman wide receiver also hauled in a 48-yard touchdown from Haener on Monday. Something to keep an eye on. — Sophomore placekicker Peyton Henry connected on his only two field goal attempts on the day, each from 37 yards. — This was the first practice this spring where I noticed the offense running the option. 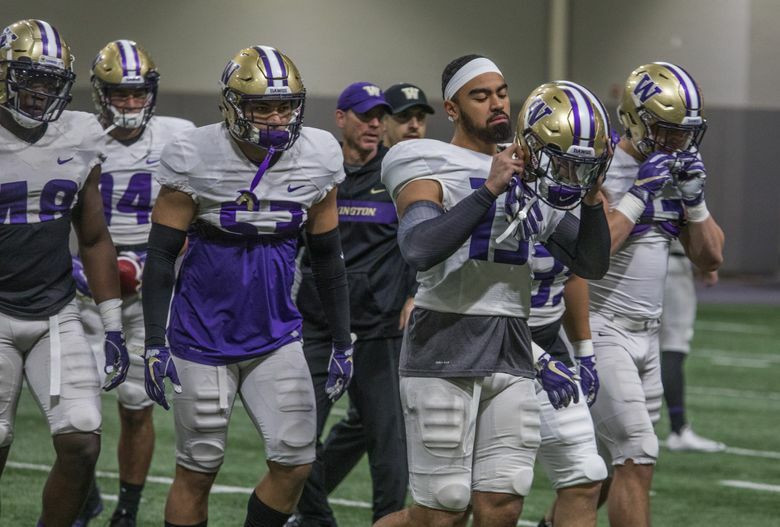 Both UW’s offense and defense are continuing to install more of the playbook as the spring goes on. — The following players caught punts on Wednesday: McClatcher, Bryant, Andre Baccellia, Trey Lowe, Fuller (though he didn’t technically participate in practice), McGrew, Ahmed and Richard Newton. — Scorpions’ “Rock You Like a Hurricane” blasted out of the speakers inside the Dempsey Indoor early in practice, and strength and conditioning coach Tim Socha started cheering and dancing, and it was really something. You’re going to have to trust me on that.